I am an eternal optimist. So, the fallacy to me is assuming that we continue updating the current type of technology rather than inventing something completely new. While I might get laughed at for being fanciful, something like contra-gravity, reactionless thrusters, or some sort of warp drive would relegate all of our awesome rocketry to the quaint dustbin just like the sailing ships. I think there is the unspoken assumption when making these predictions of "If things keep going the way they are..."
Yes, there is exactly that unspoken assumption. Partly no doubt this is because we feel connected to the paraphernalia of our own era - compare to the popular trope of portraying 25th century militaries as still given to acronyms. One example I sometimes use - if you see a chair on a Ferris wheel that is 20 meters in the air and, at that instance, happens to be moving straight up at 1 m/s, then using linear extrapolation you would conclude that the wheel couldn't have been on for more than 20 seconds, because more than 20 seconds ago the chair would have to have been underground. Yes! The whole of human technological developemnt has been a cycle of sprints and walks, with some rather dramatic change-of-directions thrown in from time to time. While I am sure that we will be using rockets for the next few-to-several decades, I'm also sure that in the 22nd century we will probably be using something different than chemical rockets for launch to orbit and for deep space missions...what that may be I don't know; it could be something that we have discussed here, or it could be something that is discovered or invented later this century. I'm also sure that if we could spend the day in January 3, 2111, we would be surprised, not only by what was familier, but what was (to us, today) to be science fiction. While I do think that thinking about the future, even predicting it, is a useful excercise to stretch your imagination, but I also agree with Henry Ford about how our predictions of the future will provide amusement to the people living in the years that we try to predict about. Of course, every once in a great while someone gets something right, but thats statistics for you! I've been turning the proposition in my head over and I keep coming to the same conclusion: progress is a post hoc jdugement of technological change, not something that can be predicted. Who in 1897 would have predicted the AK-47? Who in 1947 would have predicted that the AK-47 and assault rifle in general would, by 1997, have a greater social history -- in terms of impact, if not appeal -- than a technological or even military one? For one thing, nobody would have wanted to, because progress is supposed to be positive. For another, nobody would have wanted to believe that a small arm would become politically more important than battleships or railroads in the development of military science. Yet it has, as we have discovered that people with assault rifles are dangerous and effective, almost in inverse proportion to their technological sophistication. Automatic small arms (and RPGs or RPG type weapons) have become the anchor capability of modern warfare. That's progress, whether we like it or not. It's pushing the limits of existing capabilities. It's the advance of capabilities that is hard to predict, and what might come out of them. That's why specific predictions make no sense. Tony: I don't know whether you've ever read John Gray's 'Straw Dogs' and 'Black Mass' but I suspect that you'd get a lot out of them. His point that western secularism has merely replaced Providence with Progress is pretty hard to argue with. Doesn't progress have, built within it, an inherent requirement for improvement (unlike evolution say, where something can be less complicated/sophisticated than something before but more 'fit')? I think you hit the nail on the head, tsz52, when you said that progress, in the abstract, is about cultural narratives. But having said that, I can't credit Gray, because I don't believe that progress is an illusion. I think real progress does happen -- just not in a planned or controllable way. For example, there has been over the last twenty or so years a lot of talk about revolutions in military affairs (RMA). A lot of the positivist (in a military sense) talk has been about initiating and managing RMAs to the benefit of the initiator. The skeptics have said that RMAs are, if anything, survived. But enither side in the debate denies they happen. They just disagree about how they happen and what can be done about them. I recall lots of similar talk about what might be called the Revolution in Business Affairs (the great waves of financial deregulation in the 1980's and the massive embrace of management theory to streamline corporate structures). Similar talk/unintended consequences arose from the IT revolution and the introduction of the Internet (Dot.com bubble, anyone?). Today we see and hear a lot about "Web 2.0", even though I'm pretty sure most people still haven't grasped all the implications of Web 1.0 yet. Rick is probably right about some great "Accelerando" that brings space into the mainstream, I'm just not certain that it will resemble anything like Rocketpunk, "The Franchise", Heinlein's future history or anything else. A horrible possibility for rocketpunk fanatics is a concept like "Server Sky" means communications, computers and energy production moves into space in the form of millions, then billions and then trillions of small devices that fill the solar system, but we never need to go along with them. Even hobbyists who feel like exploring the surface of Venus simply pass the request to the cloud, and the information eventually gets back to them in stunning immersive reality. "Doesn't progress have, built within it, an inherent requirement for improvement (unlike evolution say, where something can be less complicated/sophisticated than something before but more 'fit')?" And that seems to be using a biased definition of "improvement". Becoming more fit IS improving - even if your fitness comes in needing less food, or breeding faster, or some similar species improvement that doesn't help any SINGLE organism's survival chances. This happens with technological progress too. On various occasions old technologies have been phased out in favor of newer technologies which are lower quality but also cheaper. For example, parchment being replaced by paper (which is more vulnerable to damage). A quick inventory of the number of books, letters, and notes in your home should demonstrate that this "downgrade" has definitely made certain aspects of our lives much easier. I do get a chuckle looking at the works of the past that manage the linear projection. I believe there were examples in early scifi of infantry using musket drills with laser guns, marching and shooting at each other in lines. The WWII experience colored our perception of what spaceships should be like for years with spaceship as submarine or spaceship as aircraft carrier. There's also the trend towards wishcasting. With any big human project, you have the mixture of the true believers, the dupes, and the grifters. The true believers have drawn deeply from the cup of kool-aid and believe the social narrative. Think back to Victorian times and the whole idea of the white man's burden, the mission to go forth and civilize the brown peoples of the world. The true believers were the evangelists trying to make this happen. The dupes were the ones who followed the leader and went along for the ride. The grifters knew better than to believe the hype but figured they could turn a buck off the whole effort. The one thing that always remains constant is human nature. I think any plausible future scenario should include grand visions, genuine ambitions, unforgivable hubris, great blunders and unintended consequences, just like the past. "The WWII experience colored our perception of what spaceships should be like for years with spaceship as submarine or spaceship as aircraft carrier." What exactly do you mean here? In the 1950s and early 1960s, the WWII influence was, if anything, spaceship as V-2 rocket. The submarine-like behavior didn't enter into things until Star Trek introduced the cloaking device, and I can't remember carriers and fighters until the late 1970s, at the earliest. BTW, thinking about space fighters in light of other discussions we've had recently, I think they would be justified under certain conditions. For example suppose that future sensor systems are, as is true today, efficient and effective in proportion to their proximity to the object under surveillance. One can imagine a requirement for remote, relatively maneuverable sensor platforms. If you then take the next step to arm them, suddenly remote control is not so good -- you want humans in the loop in real time. Voila...fighters, or at least gunboats, IN SPAAACE! 1. Pure fantasy, either flying pirate ships or bullets shot from giant guns into the moon's eye. 2. Original scifi with tailsitter rockets and buck rogers frippery. 3. Somewhat in that same era, saucers. But usually only the aliens got saucers; humans kept the rockets. 4. WWII-influenced, either from the interior aesthetics in Trek to the exteriors in Star Wars. 5. Rise of biowank. Different shows would then sort of mishmash ideas together. Bab5 had realistic ships for the humans, magictech for some of the aliens, biowank for the most advanced aliens, etc. Throughout all that time, there's been a tendency to make the tech look like what we're dealing with. Even if the ship exteriors were exotic, the interiors tended to look more like modern CIC's in navy ships. I think a big problem the set designers run into is "How do you depict something far in advance of modern tech while keeping it comprehensible to the audience?" Telepathy might be an incredibly logical and obvious advancement a hundred years from now and everybody could use implants to beam their thoughts. But how would you even go about depicting this on-screen in 2011 without it looking rather silly? How would you depict the crew fighting the ship in some dramatic combat action when they're all disembodied brains in racks? You could describe it in print but it would suffer visually. It's sort of the same problem the BSG guys came up with when trying to depict what a Basestar would look like inside in the new series. Wait, so the bots created skinjobs to replace them and deactivated themselves? Robot suicide? And the skinjobs dress in human fashions and faff bout in benign human-comfy interiors in these menacing bioships? I couldn't tell you what it should look like but I can tell you this fell short! WWII in space is still the most cherished model of space combat, at least on TV and in cinema. It's actually rather unusual to even have cruise missiles depicted which were one of the main cylon weapons in the new BSG. Usually the ship combat is down to point-blank ranges even by WWI standards with guns tearing ships apart. "3. Somewhat in that same era, saucers. But usually only the aliens got saucers; humans kept the rockets." This period was very heavily influenced by the V-2 design pattern. It was prominent in movies and magazine/paperback-cover art. In story text, the V-2 configuration was also often recognized as implicit in starships that could land on planets. What you call a "tailsitter" could be found in stories, movies, and art prior to WWII, but not nearly as much as after. The emergence of the V-2 and the mindshare it captured in the last year of the war had everything to do with this. 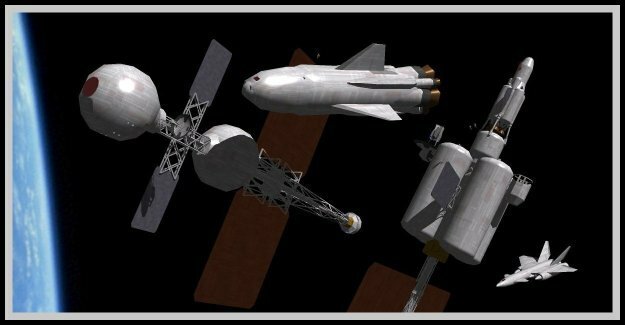 The original ballistic missile was so unexpected and futuristic (by the standards of the time) that, for a couple of decades, it was presumed that spaceships would look something like it. The shift to sub and carrier-like tropes was actually a second wave of WWII influence. It began to take hold in the late 60s, as the V-2 seemed less and less futuristic and more like something that was a contemporary commonplace. Men riding ballistic missiles into orbit had a lot to do with that. If that was the everyday reality, the future had to be something even more. The adoption of the carrier and sub IN SPAAACE! was a way of approaching that future with familiar tropes. Heck, the motivation of the Enterprise design for Star Trek was to have a spaceship approximately the size and mass of an aircraft carrier that was obviously not an enlarged ballistic missile, because that would be futuristic. It arguably still is. As for biowank, that's just a lack of imagination. "As for biowank, that's just a lack of imagination." "So, we need to design our older civilisations' ships... Vorlons?" Sorry Milo - the above post was mine, just to avoid confusion. Ah, tailsitters. My personal fave is Professor Calculus' nuclear rocket from Tintin. Tail sitters have the problem of 'fouling their own nests'. Ignoring the problems of irradiating your landing field (in which you have to then sit for a long period of time), the shear amount of energy conversion during the landing will completely slag the area you're landing on. 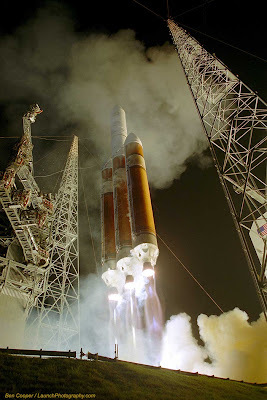 Even chemical rockets lift off from specially prepared launch platforms with blast gates to direct the force outward rather than melting the launch pad. I doubt a small nation desperate for space access will worry too much about that. Well, on earth you usually do have a runway. But as landers of an interplanetary exploration vessel, tailsitters seem to be the only design that have the potential capability of getting your crew down to the planet and back to the mothership again without requiring significant landing infrastructure or a second thruster dedicated to just getting you to the ground and off of it agian. The LEM was a kind of tailsitter... from its configuration, you could say that it used its hover as a main instead of vice versa, but the idea's the same: using the same thruster for maneuvering, landing and takeoff. Everything else is prohibitive by mass (ok, the LEM did not use the same thrusters for takeoff... it was also a two-stage rocket, which might not be avoidable for planets with close to earth gravity). Yea, the lander part of the LEM was left behind. They basically dropped a launch platform on the moon. Probably because I grew up with it, I've always been partial to Star Wars and squishy science spaceships. Got the big, glowing thrusters in back but landing relies on some sort of invisible repulsor lift field. Same for starships or starfighters. But nobody ever explained how you'd tow an X-Wing in the hanger if it's sitting on pads instead of wheels. If we ignore magical repulsorfields and antigrav then I'd have to say I'm partial to the Battletech dropships. Yes, tailsitters, but ovoid or egg-shaped rather than cigars with fins. But given the schematics, I really don't think they kept enough space reserved for any kind of realistic fuel supply. If I recall the fluff correctly, they're using some kind of clean fusion torch that doesn't irradiate the countryside. They also pull constant 1G burns from the jumpship to the planet with zero-G only when the flip at the midpoint. If I recall the schematics properly, the ratio of fuel to the rest of the vehicle by volume was probably about the equivalent of a U-Haul truck. I think you'd have trouble with that even if you had direct matter to energy conversion and a magic reactionless drive that could directly translate that converted matter's energy to thrust. I think this point has been made on other threads here in the Rocketpunk Universe, but what we are all waiting for is some sort of "new" science or technology that allows us to get off the current plateau and start a new growth curve. Yes, there was a report in NextBigFuture about a new compound which would improve solid rocket fuel, but overall, it is still an incremental improvement of rocket technology (and solid fuel technology at that, which has been in use since sometime in the late Middle Ages). Much of what we are doing in many other fields is just tinkering at the margins, not because we are not willing to do more, but because right now we just don't have all the pieces to put new things together in a reliable and economic fashion yet. Think back to the various discussions of replicator technology, fusion energy (or other pretenders to large scale baseline energy production), space launch systems or even new social and political models. Even the most ardent supporters of these things are usually forced to admit "yeah, but..." when challenged on some sort of specific. ISP's in the 1,000,000 range or Distributed Republics might be worth striving for based on their calculated and expected benefits (and I encourage this myself), but for now we are still using highly evolved "steam" technology. There are a lot of "anti" synergistic effects of this as well, for example we actually have several current means of achieving high performance space drive like VASMIR or Dexler solar sails, but without compact high energy power sources or the ability to loft the sail making plant cheaply into space, these technologies are consigned to the shelf for now. It should be noted that with the exception of Titan, most places we can send interplanetary exploration vessels to without FTL travel will have little to no atmosphere. This means the vessels have no need to have an aerodynamic shape. Which means you can get the benefits of a tailsitter with a flatter and far less unstable design. By the time we've worked on a planet/moon long and hard enough to artificially add an atmosphere (just how are we going to pull that off? ), we'll have had the opportunity to construct a spaceport too. The implications of this are interesting, a 3D printer which can lay out a complex instrument like a flute. This took 15 hr, far faster than many older 3D printers needed to make simple objects like gears. Now in any economy, there will be classes of niche objects that a hobbyist or specialist might want one of, so there is no incentive for any manufacturer to ramp up an assembly line and reap economies of scale. Now there is no easily available pricing information on the 3D printer they used, but as a start, a "machine shop" or hobby shop might buy one and supply services to the neighbourhood (might be a big neighbourhood if they are very expensive). The ability to get "one off" items quickly and relatively cheaply has interesting implications; maybe small repairs and home handyman type projects will become the norm if you can get a part or widgit or replica of a door handle just by ordering the CAD template from Amazon and walking down the street. Very small "manufacturing" companies can grow and thrive in this sort of market; small furry mammals among economic dinosaurs. Small projects and business can revive local economies, OTOH this sort of activity does not seem to scale to Rocketpunk dimensions yet except in limited cases. Airbus uses a giant sized version to build large sections of aircraft wings, but I think accuracy in layups trumps the speed of doing it in the traditional manner in this case. This technology is a physical example of disintermediation, you don't have to wait for some large company to make what you want, the process of designing and building is now in your hands. 3D printers come in handy when shipping becomes prohibitive. If you're on a five year mission to the outer planets, you can't wait around for a replacement widget to catch up. So you'd either need to stock what amounts to an extra ship in spare parts, or fabricate them as needed. The 3D printer allows the latter, potentially even having the option of recycling the old part. 3D printers won't compare in production since a dedicated widget stamp can create one in seconds. However, when you need an advanced widget, whereby the internal components are difficult to do in production, then a 3D printer might fill the role in even mass production. "This technology is a physical example of disintermediation, you don't have to wait for some large company to make what you want, the process of designing and building is now in your hands." I don't think so. How many flautists know how to build a flute? How many people in general know how to build things they think they want? Too few to motivate the "roll your own" model. As for the suggestion that designs could be purchased from Amazon and taken to the local 3D print shop, that doesn't track either. It's much more likely that a large organization like amazon would be able to afford the variety of printers and raw materials needed to run such a business economically. One would purchase the finished object from Amazon in a single transaction, where you get the product, the designer gets a commission, and Amazon takes their cut from both ends after accounting for their cost. Disintermediation is about removing unnecessary links from the supply chain, not about removing necessary skill sets and capital accumulations. Amazon and Ebay, for example, is a perfect example of reintermediation, necessitated by the demand for all of the ancillary services that a retailer can provide that producers can't. "3D printers come in handy when shipping becomes prohibitive..."
For the long mission spacecraft example, the difficulty is deciding what raw materials and how much of each to bring along. Electronics, the components most likely to fail, would be hard to reproduce. Also problematic are replacement procedures. Finally, how does one do deposition without gravity? I don't know enough about how these 3D printers work to say they couldn't be redesigned to work in free fall. However, lack of gravity won't be a problem in any case. Ships for trips that take years will rotate (at least in part) to keep the crew healthy. That gravity thing might work the other way around. People can survive without gravity but with lots of nasty side effects and it is generally a miserable existence. But you need gravity for many manufacturing processes. That leads to gravity being generated for production work rather than for habitation, and then people just piggyback on to those areas because it is convenient. I did this with the hydro refinery ships in a space opera setting.